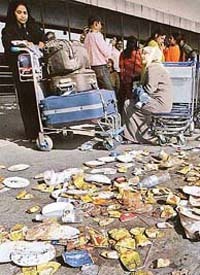 Striking employees of the Airports Authority of India could end their stir with Prime Minister Manmohan Singh personally assuring workers that there would be no job loss due to privatisation of Delhi and Mumbai airports. Is the National Rural Employment Guarantee Scheme viable? The emergency meeting of the International Atomic Energy Agency’s board of governors at Vienna overshot its scheduled calendar of two-day talks today as the 35-member board held consultations and decided to crystallise views on the Iran issue at an extended session tomorrow. An Egyptian ferry boat with some 1,400 persons on board sank in the Red Sea during a crossing from Saudi Arabia to Egypt, the maritime authorities said today. Around 185 bodies were recovered by rescuers amid fears of a much higher death toll, maritime sources told AFP. Computer virus Blackworm and its variants ravaged more than 80,000 computers across the country through its mailing worm Nymex that cut a swathe through the Microsoft Windows operating system. The SGPC president, Mr Avtar Singh, today placed Dr U.S. Dhaliwal, Principal, Guru Ram Dass Medical College, under suspension with immediate effect for indulging in unconstitutional acts. Dr Dhaliwal is the third Principal in a row since the inception of the SGPC-run medical college in 1997 who has been removed unceremoniously. The government today discussed the concept of setting up a central agency for phone tapping with the telecom operators and fine-tuning the Indian Telegraph Act. The agency would act a liaison between the telecom companies and the security agencies and there would be complete secrecy in the whole operations as to which number was being tapped, industry sources said. We will have to play the key players in the positions suited to them. Indefinite curfew was imposed today in this sensitive town following lathicharge on a violent crowd of devotees in the controversial Bhojshala shrine where Hindus and Muslims were to offer prayers according to a schedule. Hundreds of residents of the Rama Mandi area, on the city outskirts, were forced to rush out of their houses following an ammonia gas leak from an ice factory in the locality this morning. 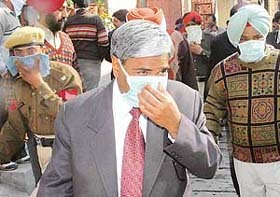 Deputy Commissioner of Jalandhar Ashok Gupta inspects the Raman Mandi area, near Jalandhar, following an ammonia gas leak from a factory on Friday.